Wife of the president, Dame Patience Jonathan has congratulated the wife of the president-elect, Aisha Buhari following the victory of her husband at the polls.In a statement signed by Ayo Adewuyi, Media officer to the First Lady, she appealed to Nigerian women to work with Aisha Buhari and give her the maximum support to make her succeed in her new assignment. 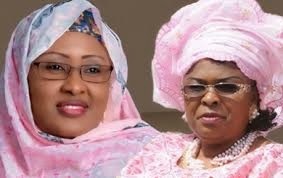 “The First Lady Dame Patience Jonathan (Mama Peace) has congratulated the wife of the President elect, Hajia Aisha Buhari on the election of her husband, General Muhammadu Buhari. “The First Lady (Mama Peace) wishes her well in her new task,” the statement read. It would be recalled that at a presidential rally in Ibadan, Patience Jonathan feared that she will be jailed if the All Progressives Congress was voted into government. Text Of A Press Conference Addressed By Chief Femi Fani-Kayode on April 1, 2015.